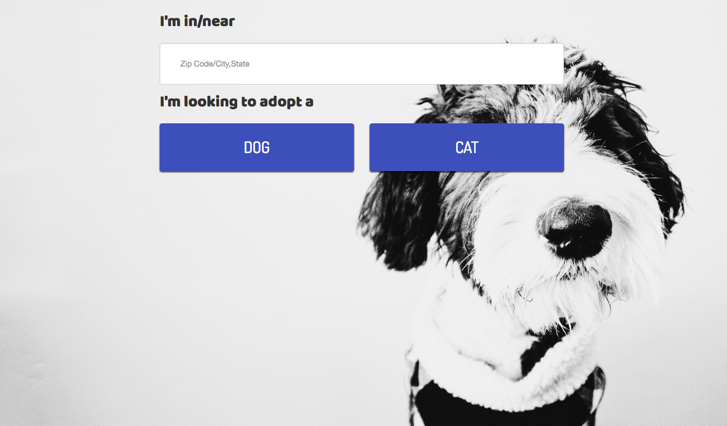 An application that displays pets in shelters near a given zipcode. This initially came to be in a hackathon with three other developers. The challenge was to incorporate three different APIs into one application and we all latched on to the idea of potentially helping animals. The main hurdle we encountered was dealing with aged APIs that are not updated often and receiving no responses from organizations that could have been a better fit. Nonetheless we dove into the JSON we received back and managed to pull data from different shelters and display the dogs or cats there. To add a bit more focus, we limited our search to dogs and cats, but in the future we want to add a filter to find a number of different species. © 2017 Miranda Bashore. All Rights Reserved.